Almost as ancient at the masonry in the castle walls are the grandmothers that walk the streets of Prague. They have waded through hell and survived: two world wars, Communism, revolution, and most recently, the heartless feeding frenzy of capitalism. They are bitter and they do not like you. They are called babičkas. No other word in the Czech language has the capacity to produce a stronger fingernail on the chalk board cringe. In the late 1300's the Black Death forced the people to turn away and cross the street as one of its victims approached - today the pestilence in Prague are the babičkas. If one hobbles towards you—get out of the way. Step aside, give her the entire sidewalk, and let her pass. If she is impatiently waiting at the bus stop, let her board the bus first. Mistakenly move ahead of her and you will find yourself on the ground with a grocery-bag-shaped bruise on your forehead. You might think that you are seeing the same person all over town, but what you are actually witnessing is the Prague army of grandmothers. They wear the same dress, and they all have the same mission: They must gather a daily ration of four buns (one to feed the pigeons), a sausage, a stick of butter, and a bottle of fresh milk. They must not overpay. They must put it all into two grocery bags, and most importantly, they must get back home before 11 a.m. They will stop at nothing to complete this mission. They will push ahead of you in line, they will haggle with the cashier over a couple korunas, they will walk in the middle of sidewalk, and they will mumble loudly if you impede them in the slightest. Their canes turn into swift swords with the slightest provocation. Ask them the time and you risk a lash across the backside. Old, very old and wield a cane or a crutch. A little hunched over, needs to crane her neck to see forward. Their uniform is a one-piece dress that stops just above the ankles and has short sleeves, is light grey, and is covered with little blue flower designs. It is clean but looks dirty. Grandmothers like the one-piece because it is warm in the winter and airy in the summer. The dress also creates a natural pouch between the knees when peeling potatoes. On cooler days, they will wear an itchy-looking sweater with big buttons on the front. They wear a babushka—a piece of cloth similar to what old men pull out of their pockets and blow their nose with. 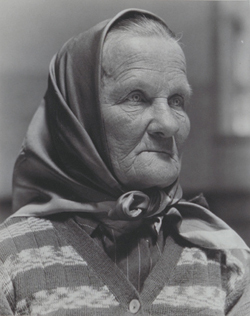 Grandmothers put a babushka on their head, tie it under their chin, and let it drop to a point down their backs. Nobody knows why they wear them. Always in a hurry, but moving very slow. Two reusable cloth grocery bags, one in each hand. They walk in the exact center of the sidewalk and are not concerned with human obstacles. They will push and complain their way through any crowd—could be a bunch of giddy schoolgirls or a rowdy pack of football fanatics. They feed chunks of bun to street pigeons. Their wrinkled faces are frowned, and they do not seem to be receiving any pleasure from it. They appear to do it out of some kind of forced duty—a burden bestowed upon them by an unknown master. If a babička notices you before you notice her it is already too late. You have upset her and will receive a verbal scolding or cane swipe at the legs. Consider a cashier line with a babička as fronzen in time. She will slowly put on her glasses and watch the price of every item pass the scanner. Only when the final total appears will she begin to search for her mini coin purse. Then, starting from the lowest coin denominations, she will attempt to produce the combination neccessary to consume the mathematically provable maximum number of coins. Handing over the coins she will ask the cashier to confirm that the 4th bun was free and not included in the total. Satisfied (but still suspicious) that she was not cheated by the System, she will begin the agonizingly methological process of placing the groceries into her two bags. A babička standing at a bank machine is logically equivilent to the machine having a out of order sign. They will force their way through the crowded bus to the door long before the bus stops at the station. Anybody who does not get out of their way will get stern looks, head shaking, and undecipherable mumbles. Be alert and stay out of their way. They need to get those groceries home before 11 a.m.